A Conspiracy of Kings, by Megan Whalen Turner, is the fourth book in The Thief series. (See my reviews of books one, two and three.) I am not sure how to summarize this book without spoilers for earlier books in the series. So I shall just say that it revolves around Sophos, a character in the first novel that is heir to the kingdom of Sounis, and is a player in a hugely important game that involves several countries and their sovereignty. Seriously, this series of young adult fantasy is amazing. I highly, highly recommend it! Once again, I am issuing an open call to whomever the anonymous commenter on my blog was who first recommended this series to me! Please send me an email to booklustblogger AT gmail DOT com, and we can discuss the series! 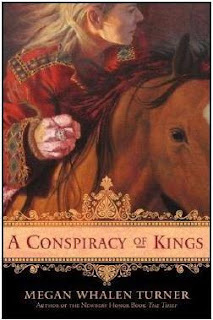 I read and discussed A Conspiracy of Kings with Kelly from The Written World. Below are our thoughts and reactions. I don't think there are any spoilers, but apologies if there are! I am the commentary in green and Kelly is in blue. For the second half of our chat, visit Kelly's blog and read the rest! I really enjoyed this book! I have heard others say they were disappointed at decreased face time for Gen, but I was ok with that. I really love Gen, but I thoroughly enjoyed getting to know Sophos better in this book. He is so different than Gen. He is less secure, less wily, and generally tries so hard to make people happy and proud of him. Turner fleshed him out very well here and made him so easy to sympathize with. I feel the same way about Eddis- we didn't get to know her better, but every glimpse I had of her made me love and respect her more. I think Turner is so great with the strong, confident roles of females in her books. They are all just as complex as the men, and I find them all fascinating. I am definitely gunning for getting a female POV in the next book! In that vein, I appreciate the way that in each story of this series, Turner gives us a different character's point of view. It gives us access to much more subtlety and complexity, I think, than if we stayed with just one narrator the whole way through. For example, in Gen's head, we get the impression that people are often disappointed in him. But here, Sophos so clearly looks up to him as a role model. I also think the relationships between the men and their fathers are so great in this series. They always make want to give whole families big, tight hugs. I also am fascinated by the political maneuvers that happen. That even though Sophos and Gen are such good friends, they still hide a lot from each other and are unsure of their footing. Not to mention the divine intervention that happens so much! I mentioned before to you how it reminds me of Greek religious history, in which the gods are so involved in each story, not just mortals. Well, there is a lot to comment on! I loved this book, too. When I first started the series I had heard lots of great things, but when I actually went to read The Thief I found it really hard to get into the book. I was worried that maybe I was too excited about the book and I was ruining things, but then the story got going and I was hooked. I have heard this same thing from multiple people. It seems that no one felt completely invested in that story until the very end and then it was like a drug addiction! I enjoyed The Thief from the get-go, though I didn't really like any of the characters much. It just seemed to have that tense atmosphere the entire time that really got to me and made me want to continue. But looking back at my LibraryThing, I only rated the first three books in this series a "4/5," whereas I gave this one five stars. I read the next two books soon after and was waiting impatiently for this book to come out. I think that the series just gets better and better. While I admit that I was saddened that there wasn't a lot of Gen in this book, I also understood that his story has mostly come to an end and it is time for him to play a secondary role while someone else dominates the story. I think it turned out really well. Gen was still in it, which made me happy, but we also got to know Saphos. I was surprised at just how different he was from Gen, but also impressed that once again she managed to write a character that jumped off the page. I feel the same way! I think Sophos was called "Useless the Younger" in The Thief, so it was great to be with him as he came into his own. More than the other books, I think this was the closest to a "coming of age" tale. I am glad that Turner was able to make such a vivid character- not only Sophos, but the other characters as well. It's clear they all know each other well, but not well enough to anticipate each other's reactions. I agree with you that I enjoy the different character point of views. Everything is so one-sided without it, so I am glad we get to see several different sides of the story. It worked well for the relationship between Gen and Sophos in this novel. If just Sophos told the story I think we would have missed out on a lot and maybe this series wouldn't be as strong as it is. I am looking forward to a female getting the lead in the next book. Turner writes strong female characters, so I think it is time that she gave them their chance in the spotlight. I enjoy both of the queens and think that they deserve as much page-time as she can give them, because even when they only appear for a moment it is worthwhile. For the remainder of our discussion, go to Kelly's blog! Awesome joint review! I am so glad to hear that this fourth book is so impressive and I am also curious to find out if the next book will have a female protagonist as well. I will have to remember to come back to these reviews after I have read The Thief, though I know once I start with the books, it will be like a snowball rolling downhill and I won't be able to stop! Off to check out the rest of this conversation over at Kelly's! It took me a few chapters to get into The Thief but I ended up being quite impressed: it's good to know that the rest of the books in the series are rewarding as well. This makes me even more excited to read the latest book in this excellent series. I love this discussion! I also hope the next book has a female POV. I'd love to get inside Eddis's head, or Attolia's. I am not sure if this book is for me, but thank you anyway for your great review, Aarti! I loved the way you did this joint review with Kelly. Sounds like an interesting book. Thanks for the great review. I am so sorry I've been MIA on this blog for the past three posts! I will be better from the next one forward. Thanks to everyone for comments, and I highly recommend this series. It is FABULOUS. There's a fourth book in this series?!!!!! I'm with Memory; I'd love to go inside Attolia's head.